…We have blundered all summer long and now we have capstoned our blunders by blundering into a war with England. So be it. While there’s life, there’s hope; but I go into the army with a bitter feeling against those under whose lead we hae come to this pass, and amid all the shattered idols of my whole life I don’t feel as if I cared much when my turn came. I suppose now I shall go into the field against a foreign enemy and I ought to rejoice at that. Still, I don’t. Against the rebels I could fight with a will and in earnest. They are traitors, they war for a lie, they are enemies of morals, of government of man. In them we fight against a great wrong – but against England, we shall have forced her into war when she only asked for peace; we shall have made that acause of a quarrel which a few soft words might have turned away. It will be a wicked and causeless war wantonly brought about by us and one in which I most unwillingly would go to my death. I shall probably have joined my regiment this week or early next. You will be surprised to hear that I shall probably regularly enlist and make my debut as a simple sergeant… I shall rought and fight it out with the rest, sleep fifteen in a tent with stable-boys, groom horses, feed like a hog and never wash, and such is my future! Well, it is better than my present, for I shall at least, by going into the army, get rid of the war. Remember – the Trent Affair didn’t clear up for a while. In December 1861, Americans were still holding their breath; Northerners expected a war with England and Southerners hoped England would join the conflict their side. The possibility of an international element in the Civil War had everyone (who knew about it) anxious. It also brought feelings of frustration to the surface. Clearly, Adams was irritated with all the “blundering” that had occurred in 1861. From his perspective, there was little hope of success, especially if England entered the conflict. Ultimately, Britain would remain “neutral” but, in 1861, nobody knew that. 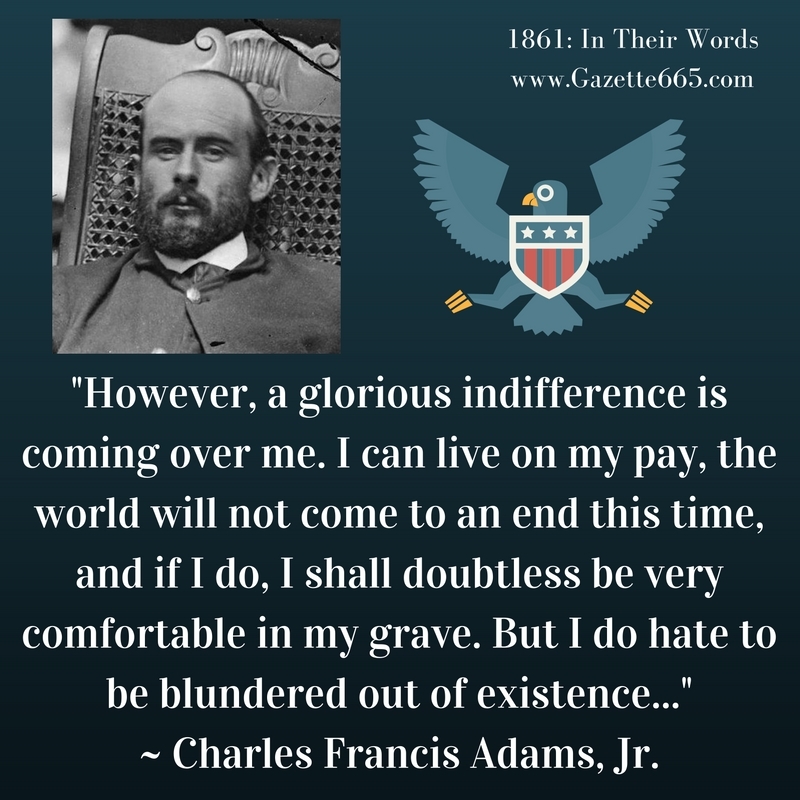 Charles Francis Adams, Jr. was determined to be indifferent, but he wasn’t. This guy was a thinker who was seriously frustrated about the diplomatic situation of the United States. He was “close” to the problems because his father – Charles Francis Adams, Sr. – was the U.S. ambassador to Britain. His younger brother – Henry Adams – kept him informed of the diplomatic trials and tribulations. 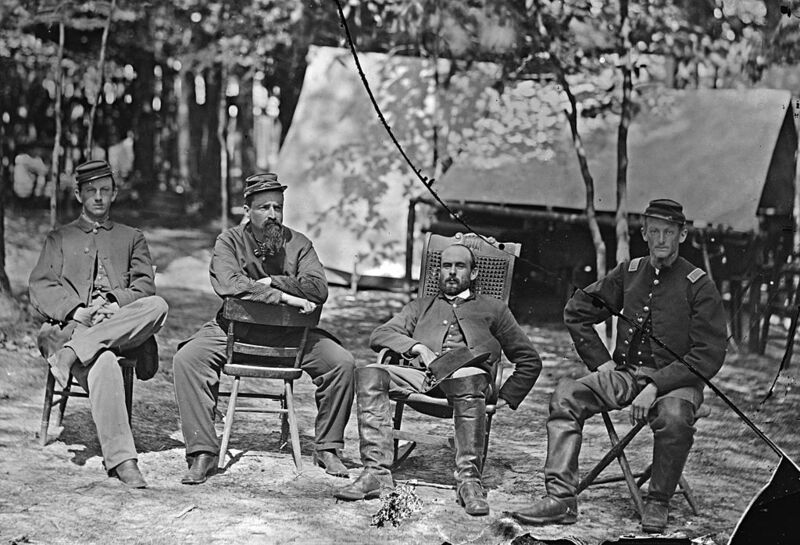 Charles Francis Adams, Jr. with comrades from the 1st Massachusetts Cavalry. Adams is second from the right. It’s easy to forget the feelings and beliefs of the moment when studying history. Since we know England didn’t officially support the Confederacy or join the war, it’s not hard to ignore the feelings of desperation that engulfed some Northern citizens at the end of 1861. Adams seems especially despondent, but keep in mind that he was fairly well-informed of the serious diplomatic situation by his father and brother. Though perhaps in deeper despair than others, his letter and tone reflect the feelings of frustration felt throughout the north at the unsuccessful prospects facing them as 1862 dawned. P.S. What stands out in the letter to you? His more hatred for his former country men then for the English.